(Spindle Tree) Gold Splash® Euonymus brings a real improvement in Euonymus! The big, round leaves of this selection have bright, gold variegation that is very stable. It has far more impact in the landscape than other, older varieties. 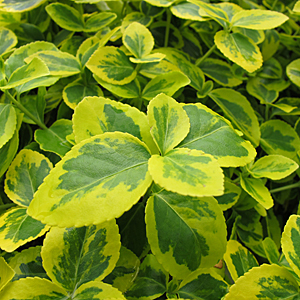 The disease resistant foliage of Gold Splash® maintains its color all year long, and is accented by showy, persistent yellow fruit and orange seeds in the fall. A Proven Winners® ColorChoice® Flowering Shrub.